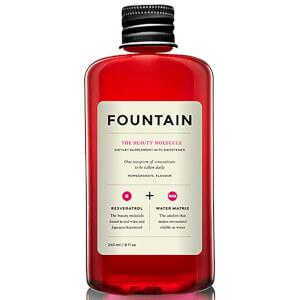 Fountain The Hair Molecule is a beauty supplement that can help to stimulate the growth of your hair, leaving your tresses looking and feeling strong and healthy. Boasting a delicious berry flavour, each 10ml serving of the supplement provides 10000 micrograms of silicone and 200 micrograms of biotin, which work together to encourage rapid hair and nail growth, whilst helping to hydrate dry scalps. 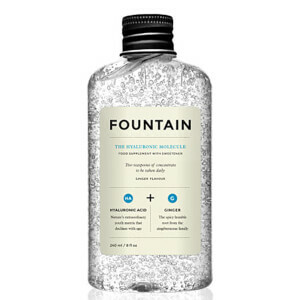 With a vegan-friendly hyaluronic acid matrix which preserves moisture within tissues to support hair growth from within, Fountain The Hair Molecule is suitable for adult men and women, whilst also being free from artificial colours and flavours. - L.M. Water, Sweetener Xylitol, Silicon Dioxide, Natural Flavor, Preservative Citric Acid, Stabilizer Xanthan Gum, Biotin Complex (Dicalcium Phosphate, Biotin), Hyaluronic Acid, Preservative Potassium Sorbate.